If you’ve ever dealt with dog separation anxiety, you know it can be heartbreaking. Seeing your pup’s worried face when you’re getting ready to leave the house is enough to make you want to quit your job and stay home forever. Unfortunately, that’s just not realistic for most of us! Even if you do work from home, you must leave the house eventually! Here are some tips to help ease the suffering of dog separation anxiety. 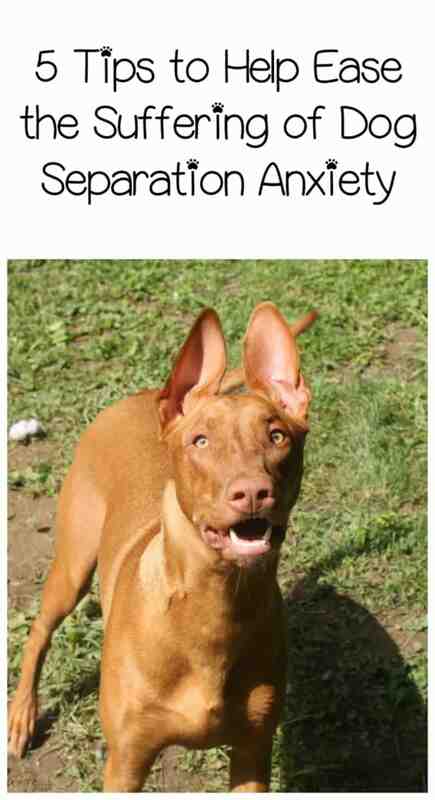 My Pharaoh Hound, Freya, has major separation anxiety. My mom lives with me, and since we’ve adopted Freya, we’ve never left the house together. I kid you not, she is literally never alone. Still, she gets very upset when either one of us leaves the house. She paces, whines, and hugs us goodbye like it’s the last time she’ll ever see us. Have you ever seen that meme with the dog looking out the window all sad, and the caption reads, “She never comes back! Every time she leaves the house, she never comes back!” That’s my Freya! It took us a while, but she finally doesn’t pace the house crying the whole time one of us is gone. While different trainers have many ways of dealing with separation anxiety, I’m going to tell you what worked for us. You might be tempted to just sneak out the door and hope your dog doesn’t notice, but trust me, this does not work. I tried it once with Freya. When I got home, my mom told me she spent the entire time searching for me, and I felt absolutely horrible. Now, we give Freya plenty of notice that we’re getting ready to leave. She’s learned the cues, and I don’t try to hide them. She knows when I put on makeup, brush my hair, and get dressed, it means I’m getting ready to go out. Let your dog see your “going out” routine and get used to it so she knows when you’re preparing to leave the house. It’s also a good idea to use a set of key words or phrases as you’re getting ready to go. For example, I tell Freya, “I’ll be right back, you stay here.” Except I sing it in the same tone every time. I’ve done this with all my dogs. It sounds super silly, but it lets them know that your departure is imminent. When I get home, I say, “See, I told you I’d be back!” I don’t know if they understand all the words or just the tone, but it’s just one of the little things that adds up to an overall routine help ease their suffering and fears. Freya is an incredibly high-energy breed, so tiring her out is a challenge! Still, I find that if I play a round of her favorite fun agility games (we’re working on agility training right now), she’s more likely to just chill on the couch when one of us leaves. You may need to get up a little earlier to fit in a brisk walk or a rousing game of fetch but think of it this way: you’re not just tiring out your dog, you’re getting a good workout in before you start your day! Just make sure you give her a little time to settle down before you go. It’s not fair to leave right in the middle of a game. Most training guides for dealing with dog separation anxiety will tell you to not make a fuss when you leave. That’s good advice for the most part, but that doesn’t mean you should completely ignore your dog as you go out the door. Freya needs to give “hugs” before we leave. It’s just something that makes her feel better. She does it when she gets a “boo-boo,” too. In the beginning, I was following training advice that told me to ignore her, to push her off, to basically pretend she didn’t exist as I got ready to go. All that did was make her more frantic and made me feel like a horrible dog mom. Now, I kneel on the floor before I go, tell her I’ll be back soon, and get my big Pharaoh Hound hug. Afterward, she calmly watches me leave and we’re both happier for it. Giving your dog something to do while your gone can go a long way to easing separation anxiety. This is where interactive toys come in super handy. Keep a few fun toys aside that you only bring out when you’ll be gone. That way your dog doesn’t get bored with them. Freya has this little plush bamboo tree that comes with panda bears. You put the bears in the tree, then she has to try to get them out. Oddly, this is the ONLY toy that she hasn’t torn to shreds. This is another tip that may be a bit contrary to other advice that you’ve read, but it works such wonders with Freya. I lavish her with love and affection the moment I get home. I also bring her prizes, so she knows that when I leave, she’ll get something exciting on my return. Now, I don’t recommend buying a new toy every single time you leave the house. I fell into that trap and spent a small fortune! Instead, vary the prize. Sometimes it’s a toy, sometimes a treat, and sometimes it’s just green beans. My dogs LOVE green beans, and they’re a super low-cal treat. 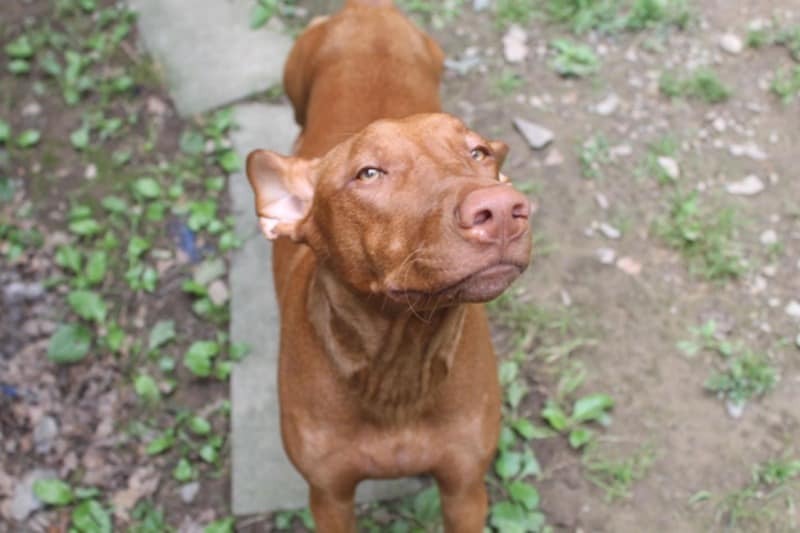 If you don’t want to get into the pattern of having your dog expect a surprise every time you go out, simply praising her for being such a good girl while you were gone and playing one of her favorite games once you get settled in can go a long way. I know that some of these tips are the opposite of other training guides for helping to ease the suffering of dog separation anxiety, but they’ve really worked for me. Freya can watch us leave the house without having a meltdown. She relaxes while we’re gone, then lavishes us with affection for about two minutes when we return before going back to doing her own thing. Remember, every dog is different. What works for 1,000 other dogs may not work for yours, and what works for yours may not work for 1,000 other dogs! I am a huge proponent of reward training for all dogs, but with Freya, it’s an absolute must. Her breed only responds to positive training methods. It’s also important to remember that part of the reason your dog is suffering from separation anxiety comes from her bond with you. She misses you when you’re gone. That love should never be responded to with punishment or cold indifference. Another thing to remember: some dogs are just more prone to separation anxiety than others! For example, many of the smaller pups on our list of hypoallergenic dogs tend to be a bit more clingy than working breeds! About the Author: Nicole writes and edits for DogVills.com, a site dedicated to helping both new and seasoned dog parents with everything from choosing the right breed to training to dealing with health issues. 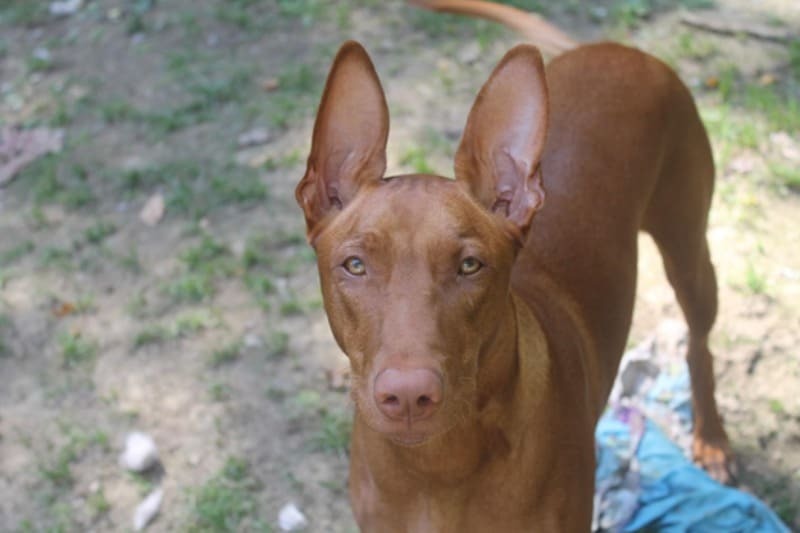 I’ve never heard of a Pharaoh Hound. Freya is beautiful! Thanks for the great tips! I am told all the time how my dog will cry and I know he will go from window to window when I am leaving the home. He knows when it is work days and seems me in my dress clothing so he calms down quickly. But, going to the store, he will remain in the window until I get home. These are very good tips! Thank you! I had a dog like this. I couldn’t go no where with out him. he’s jump thru windows to follow me or eat my new shoes if he was left alone. I let someone else have him because I couldn’t keep him with 2 little kids. My grandson had issues with their dog chewing thru metal crates to get out to go after him.